Maine Coast, a live lobster wholesale company headquartered in York, Maine is proud to announce it has been awarded a place on the Inc. 5000 list of fastest growing privately held companies in the United States. The ranking, released by Inc. today, lists Maine Coast at 2,749. “We are thrilled by the recognition. Our growth is strategic; to grow at this rate, we are constantly reinvesting in our company,” explained Tom Adams the company’s owner and CEO. Adams notes that a focus on innovation, logistics, and infrastructure, combined with professional development of Maine Coast’s employees, and by branding and targeting new markets have supported the company’s incredible growth rate. In September, members of the company’s sales and marketing teams will be traveling to Hong Kong, Singapore, Thailand, and the United Arab Emirates to work with their existing customer base and target new business development. 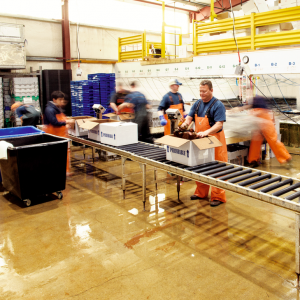 “It is a great honor to represent Maine, the lobster industry, and the US seafood industry as a whole on this esteemed list of other rapidly growing companies. I believe this award reflects the hard work and dedication of every single employee at Maine Coast,” Adams concluded. What is New Shell lobster? Learn about Maine's sweetest season.